I don’t have a perfect score in my pathophysiology class. Yes, I am one of those obsessive types that agonizes over the points lost, not rejoices over the points scored. I have a score in the low 90’s. Doesn’t make me happy. Must quit slacking!! My chickens don’t want to go into the coop at night. We bought a solar powered chicken door, and we remodeled the coop to put the nesting box on the outside of the coop so they would have more room inside. They still don’t want to go in, though when I take them off the roof and toss them into the run they go into the coop without hesitation. Still, it’s a hassle to go out every night and scoop chickens off the roof and put them inside. Here you can see my uh…skills (snicker) in carpentry. The box used to be inside on the floor. That’s why my nice red paint job is covered in manure stains. I had to cut the back and put hinges and a latch on it to keep the raccoons out and to let us get the eggs. The box is attached top and bottom with flanges and screws, but it worried me that it didn’t sit quite level so we put the brick under it to prevent it pulling out the wall. Oh, and the wood leaning against it is usually held in place against the wire with bent nails I can turn to take the wood on and off. It gets too hot in the summer so I lean it and they have their privacy; in the winter it’s held tight in place for protection and warmth. We need a bigger coop. And my son knows where we can get one, we just need to rent a truck or trailer to get it after we pay for it. *sigh* more gripes. More hassle. Where will I put it? 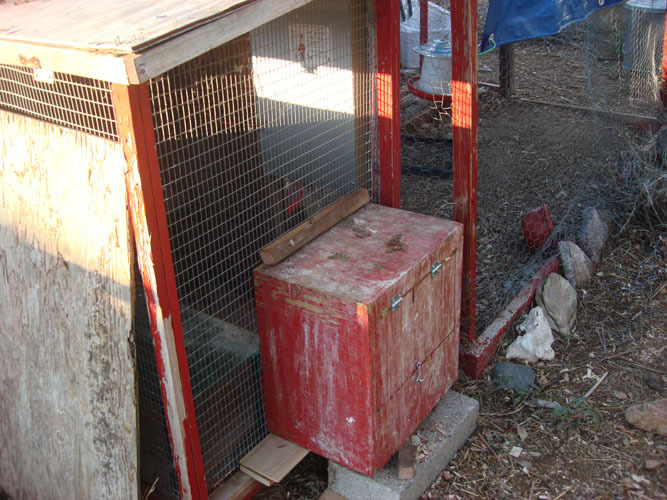 Our county recently changed the laws so our chickens are finally legal, but the placement of the coop isn’t. It’s closer than 15 feet to the property line. Where the hell I could put it on a quarter acre that it wouldn’t be that close I don’t know, since our house is only 20 feet from the property line at the back, and less than 10 feet on either side. Would they really like me to put it in the front yard? Somehow I don’t think so. And I wouldn’t like it in the front yard either. My yard looks crappy but I don’t think adding chickens would improve the ‘curb appeal’ at all. The paperwork at my new job is making my head hurt. I feel stupid because I keep missing things I shouldn’t, simply because I’m not reading it carefully enough; I am rushing because I’m so behind. I finally caught up on paperwork from two weeks ago that was due within 48 hours of the visit. I am hoping this week will prove easier regarding my paperwork now that I’m finally getting a little familiar with it. Gripe, gripe, gripe. My house is a mess, and I care but not enough to do something about it. There are no magic fairies to clean, no children to enslave for an allowance, and no money to hire a housekeeper! I’m it! Gripe, Gripe. My garden is a disaster. I have sweet potatoes and potatoes sprouting in the house that need to get put outside. I have onion sets in a bag that need to get put out. I need more manure and compost. And I need some time. Not today, too hot and I have school in a few hours. Like Roseann Roseannadanna said, “It’s always something.” Tomorrow it will be something else. I have a roof over my head, food in the cupboard, and clothes to wear. I have a job I like, family that puts up with me, and that is more than many have. It’s enough.